UV technology can be more effective than chemicals in destroying certain waterborne contaminants without altering the taste of the water. This makes it a practical process for treating water that is used for drinking and other industrial applications. 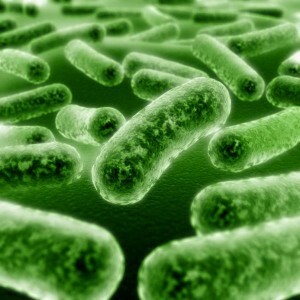 UV light disinfects by penetrating microorganisms and disrupting their DNA, preventing microorganisms from multiplying. The only function of a microorganism is to breed and produce colonies, which is why when we ingest microorganisms they make us sick. These organisms get into our intestinal system, begin to breed and produce colonies which cause our bodies to react trying to get rid of this invasion. 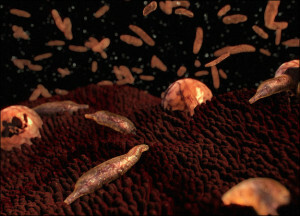 A microorganism which cannot breed is of no concern. 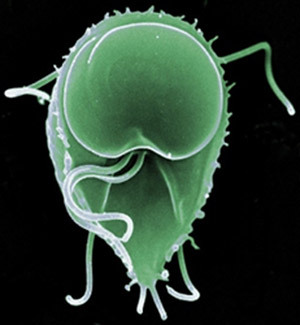 The microorganism responsible for 50 deaths and widespread illness when it contaminated Milwaukee’s drinking water supply in 1993, is almost completely resistant to chlorine. Causes gastronintestinal complications, sometimes referred to as beaver-fever, and is also highly resistant to chlorine. For those of you that like a slightly more in-depth explanation of how the UV works the following will be useful. It also extends the use of UV from drinking water into Industrial applications. Light is electromagnetic radiation or radiant energy traveling in the form of waves. 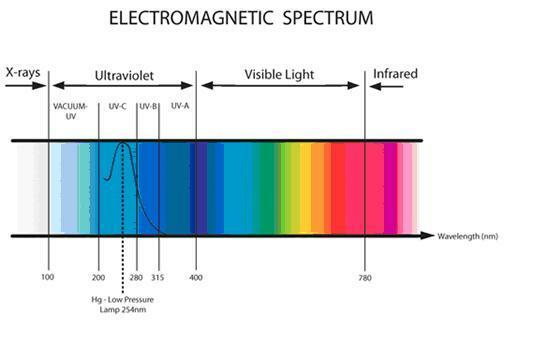 Ultraviolet (UV) energy is found in the electromagnetic spectrum between visible light and x-rays and can best be described as invisible radiation. The energy employed for UV water treatment is further categorised into two primary levels measured as wavelengths – 254nm and 185nm, where nm=1/1000 of a micron. For disinfection and ozone applications, the 254nm wavelength is utilized. For TOC (Total Oxidizable Carbon) reduction and chlorine destruction applications a unique wavelength is utilised. The UV light penetrates the outer cell wall of the microorganism, passes through the cell body, reaches the DNA (deoxyribonucleic acid) and alters the genetic material. The microorganisms are thereby destroyed in a non-chemical manner. The 254nm UV light is also used to destroy residual ozone present in a water stream. The 185nm UV light, utilized in TOC reduction applications, decomposes the organic molecules. The 185nm light carries more energy than the 254nm light. The 185nm light generates hydroxyl (OH·) free radicals from water molecules. The use of UV technology for water treatment has several inherent advantages. UV light does not ‘add’ anything to the water stream such as undesirable color, odour, chemicals, taste or flavour, nor does it generate harmful by-products. It only imparts energy to the water stream in the form of UV light to accomplish the process of disinfection, TOC reduction, ozone destruction or chlorine/chloramine destruction. UV disinfection produces no residual disinfectant to the finished water. Our UV systems feature low and medium pressure mercury discharge lamps. The lamps are constructed with a special quartz envelope material that looks like glass, but is actually a discriminating filter. This exclusive design allows predominantly 254nm or 185nm UV energy to be transmitted into a water stream as it flows through the UV system’s treatment chamber. The primary uses of UV for water treatment are: disinfection, TOC Reduction, ozone destruction and Chlorine Destruction.